I guess you can call me a bindlestiff; I’ve latched on to the Gobi Gear Hoboroll and I’m not letting go any time soon. Of course, the Hoboroll isn’t just for hammock nutcases like me (or hobos for that matter); it’s a very useful packing and organizing tool for just about anyone who takes stuff on the go. It’s great for backpacking and bicycle commuting; a perfect little gym bag, travel carry-on, and great suitcase companion. Over the past few weeks, I’ve used the Hoboroll in all these activities. At its core, the Hoboroll is a double-sided stuff sack with five internal compartments, or dividers. 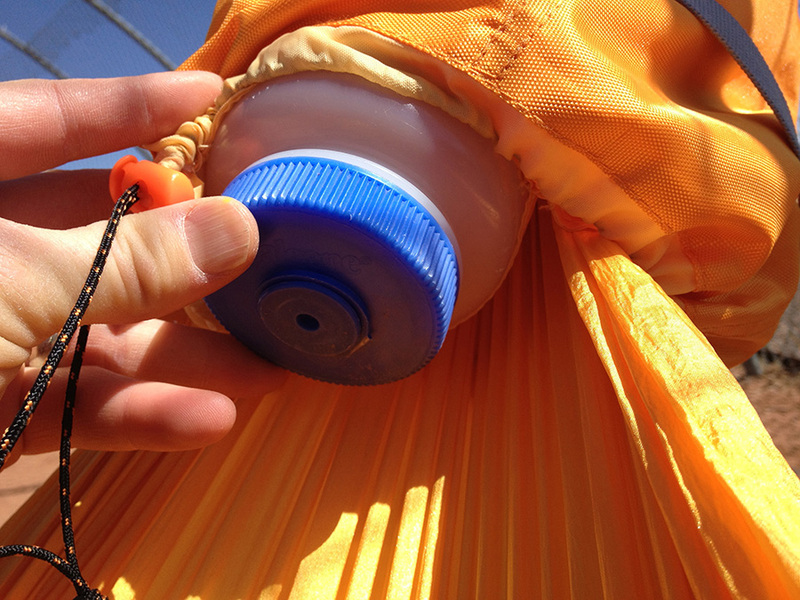 The bag provides a separate storage space for keeping gear organized. Compression straps help reduce space in the bag. On each end, the Hoboroll has cinch-style enclosures with a cord lock. Around the middle of the bag are two compression straps with buckles. The compression straps actually join together, forming a handle or strap. It’s a clever way to combine a carry handle/strap with the compression straps. The compartments are large enough to fit a 1L Nalgene water bottle easily, along with a pair of trail runners, a towel, a change of clothes, etc. I’ve taken the Hoboroll on a few business trips, using the bag to keep my gym clothes and shoes separate from my slacks and shirts. It worked great as I used it to keep my soiled clothing and running shoes separate for the flight home. I’ve used the Hoboroll on a few day hikes, using the compartments to store a water bottle, a light jacket, and a hammock. When the Hoboroll is packed lightly, the compression straps form a much longer handle, allowing me to use it as a shoulder strap like a messenger bag. This is really convenient for me as I like to have my hands free while I’m hiking. For backpacking, I was really excited because I was able to fit most of the gear I take on a summer trip: a hammock (with suspension), tarp, sleeping bag (top and bottom quilts), and extra clothing. The only thing I didn’t fit was consumables: food, water, and kitchen items. 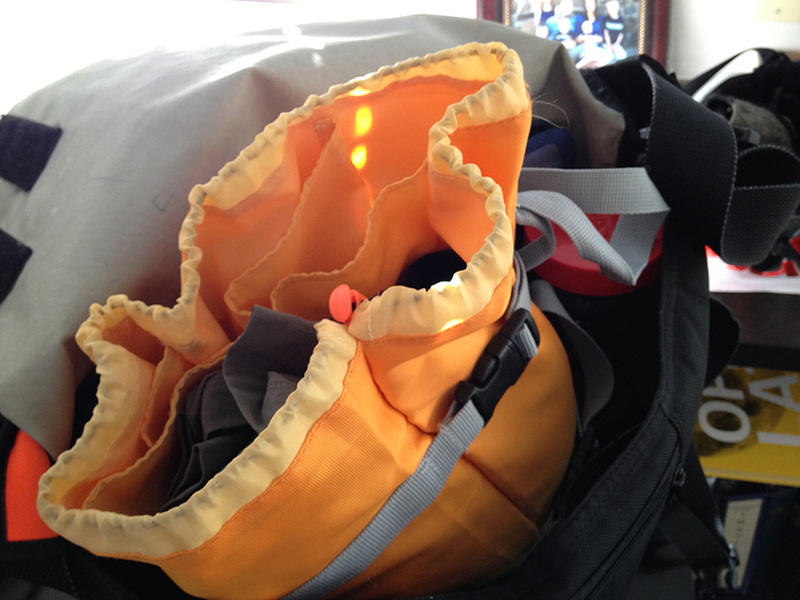 When the Hoboroll is packed to the gills, the compression straps only provide a short carry handle. This is where I started to see that the compression-strap-as-carry-handle has a flaw. When the bag is packed full is when I would really like to have a shoulder strap so I could carry the weight more easily, but all I’m left with is a carry handle. When the bag is lightly packed, I have a long strap where I’d prefer more of a handle. Hoboroll inside my messenger bag. For a gym bag, the Hoboroll really excels. I can fit a change of clothes, water bottle, a towel, and even a rolled Yoga mat under the compression straps. The only real downside is the carry strap. I would love to sling the Hoboroll over my shoulder when I’m walking about, but with a moderate workout load packed inside, the carry handle isn’t long enough to go over my head and I’m left with a hand bag I can slip on my shoulder. Since the shoulder/carry strap hasn’t been ideal, I’ve been putting the Hoboroll in my messenger bag. I commute by bicycle and love my messenger bag, but it does get dingy inside. When I carry my change of clothes inside I always put them in a separate stuff sack, but the Hoboroll has really changed that for me. Now I can easily keep sweaty clothes away from clean(er) shirts and away from what else is in the bottom of my bag. I’m a huge fan of double-sided stuff sacks for hammocks, so naturally I used the Hoboroll as a jumbo stuff sack for my hammock gear. It actually worked out great as a peak bag/organizer once the hammock was deployed. The bag stayed secure on the end of the hammock and I was able to access the gear pockets while I stayed in the hammock. With the double-sided openings, I was able to stuff my hammock without getting any gear on the ground. While the Hoboroll is currently a great organizing and packing tool, here are the top four things I’d love to see that would make this a sweet, all-purpose “go” bag—something that would make me ditch my messenger bag, or even incorporate into my lightweight backpacking regimen. Longer end collars to seal off the ends completely (maybe even a roll-top enclosure). Keeper loops for compression straps (ditch the daisy chain loops). External zipper pocket with key fob. 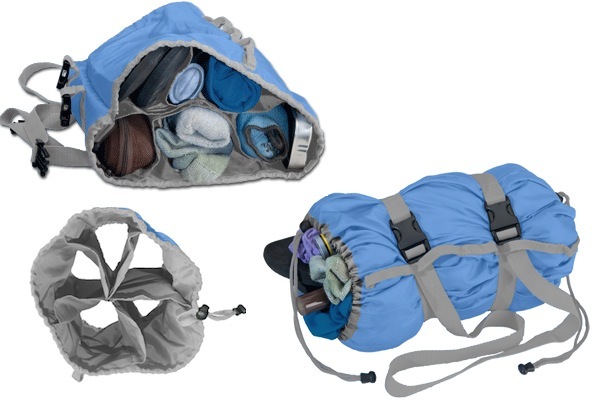 Bonus Request: While I love the grab-and-go nature of the Hoboroll AS-IS, it would be great to see a it lose a few more ounces with lighter fabric, plastic hardware, and straps. 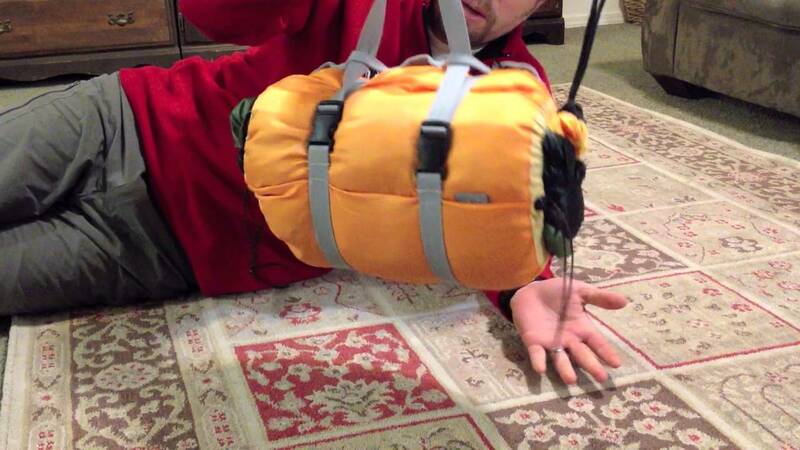 While the Hoboroll isn’t a heavyweight, with just a few minor adjustments in the build parameters would make this an easy replacement for the typical roll-top stuff sacks used in backpacking. And with a different carry strap, the Hoboroll would make a killer peak bag. Disclosure of Material Connection: I received the Hoboroll for free from Gobi Gear as coordinated by Deep Creek Public Relations in consideration for review publication. hope your system is working now. It looks like it is. Thanks for checking! Derek, I think that the hoboroll is a great idea for a bag. It just seems so innovative and different from your typical shove everything in and not be able to find it duffle bag. Thanks for the review. PS that is awesome to hear that you bike commute too. How far is your ride? Thanks man! It’s been very useful, that’s for sure. I think I’d like to see a lighter version for backpacking, but overall it’s a great deal. It’s 12 miles (19 km) from my house to work. I often cut that in half and use the bus in the morning. Is this something that you continue to use? I like the idea but worry that it could end up staying on the shelf. That is always a risk of course. I am just wondering if this has stood the short test of time since your review. I don’t use it for backpacking much because of the weight, but that’s just me. It’s not extremely heavy and folks not concerned with going really light probably won’t mind. I’ve spoken directly to the owner about modifications and they have some lightweight models on the horizon. I do use it almost daily as part of my bicycle commute bag. I put a change of clothes and other gear that goes into my messenger bag. It keeps my clothes organized (soiled vs. clean) and keeps everything away from whatever else happens to get into my bag. I also use it often when I travel, for both business and personal trips. It’s a very handy organizer. 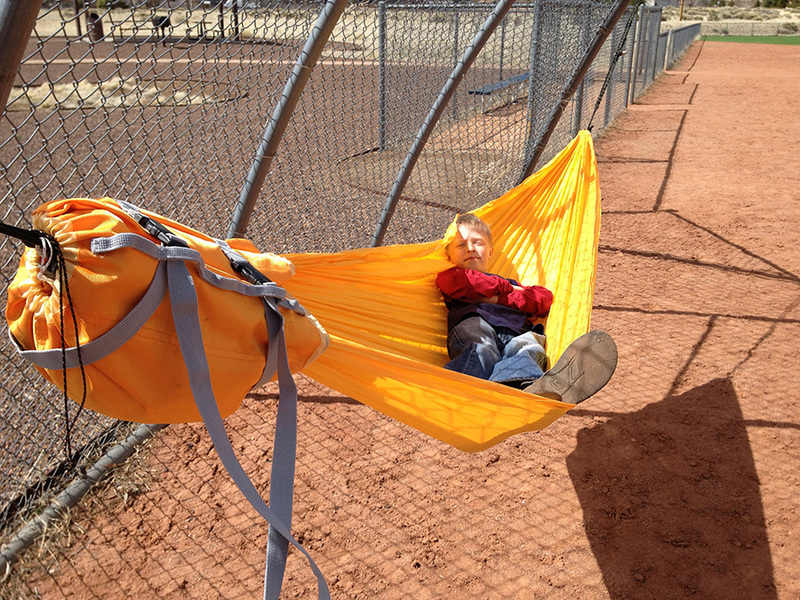 On my trip to Lake Powell this summer, I packed nearly everything—including my hammock—in the Hoboroll. I think it is useful for me for a variety of trips. When they come out with a lighter model (and maybe a few other modifications to the collars), I’m sure I”ll use one for backpacking. I use mine to stash my Dutch double chameleon with all the accessories, works great for that. Also have used it as an indoor climbing gym bag and a duffle. The new sega sacks are great for organization also.